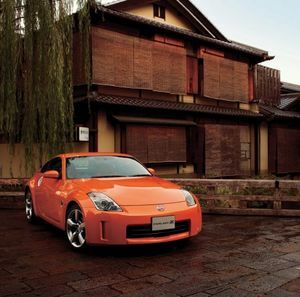 The Nissan Fairlady is Nissan's most popular coupe in the line up.The car has been redesigned for many times.The present generation is the 370Z. Compare to the 350Z,the 370Z has shorter wheelbase,wider body,and better performance.All the details have been updated to meet Nissan's newest design language.The front bumper resembles its brother,the Nissan GT-R. The 370Z's cost is cheaper than the competitors. It uses 1982 CC engine with a 5 speed manual transmission as the only option. It shares the same platform as the Nissan Silvia.Also called Datsun 1600. The left hand drive version is called SPL310.Only 300 units were made.It is very rare and exclusive.The 1964 model has dual SU carbs. The third generation isn't really different from the second generation.Only some mechanical parts were replaced.Only 217 units were made.A very rare number of production. This is the first Datsun that is imported to the USA.Only 288 units were produced,making it very rare to find.It is using the 1189 CC engine.Despite that it is very rare and antique,the unrestored one is sold for US$100,000. The first generation of Fairlady was available in Datsun brand.It is powered by a small 988 CC engine.Only 20 units were made,so it is really exclusive. This page was last edited on 21 August 2010, at 02:24.